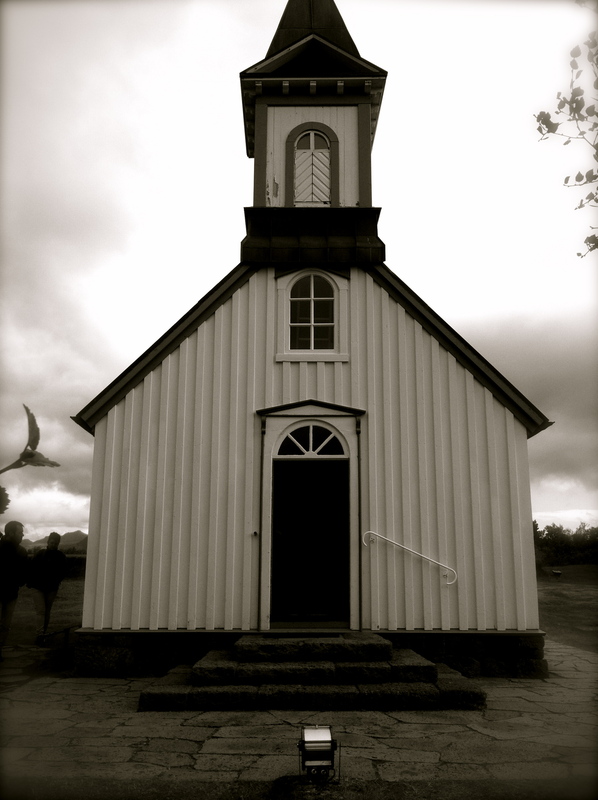 A small church in the Icelandic countryside. It has no relevance to this story other than the fact that it is pretty and I probably stalled the car while driving to it. When I learned to drive at age sixteen, my father wisely insisted that I learn how to operate not just an automatic transmission but also a manual 5-speed. Unfortunately the only car with stick shift available to us at the time was my sister’s “hey girl!”-blue Volkswagen Beetle, which she’d decked out with polka dots and daisy air fresheners making it a mode of transportation that reeked of as much masculinity as the Pony Pals theme song and hot pink nail polish. So it was that I found myself, on numerous occasions, in the driver’s seat of a car named “Dorie” stalling out halfway through an intersection while my father tried to calmly but insistently instruct me: “now ease of the clut-okay, okay, okay… try again!” Drivers swerved around us. Cars honked. Middle fingers waved out windows. What’s worse is some of the neighbors recognized us and gave us looks of pitiful concern, the kind you often see on parents when they are trying to figure out whether or not it’s their child that just pooped in the pool. When all was said and done, I’m not sure which cost more: the ensuing therapy or replacing the transmission. And Dad, for the record, I’m sorry about the whole neck brace ordeal. It didn’t look too bad on you. All of which goes to say that, since that time, I’ve had little to no practice in the art of driving a stick-shift vehicle. And this doesn’t bode well for getting around in Iceland. Iceland, as with many European countries, favors manual cars. While automatic transmissions are now available (whereas ten years ago, they were almost non-existent) a stick shift is much more common than in the States. When Bill picked us up from the airport, I noticed almost immediately that he had a manual car. Throughout the following weeks as he gave us rides to various locations and events, I admired Bill’s handling of the car the way a child admires a quarterback throwing a perfect spiral. He changed gears seamlessly; he never once stalled out or faltered. It was a form of art, I tell you. And I wanted to try it. Bill nodded and decided it’d be good for me to get some practice, in case we needed to rent a car at some point or he wanted a relief driver on some of our longer trips. So it was, a few weeks later that we were finishing up dinner one evening during a conference in the countryside and Bill asked if I wouldn’t mind taking over. “Driving,” he said. “Get some practice. I might rest on the way home later. My wife had been listening to the conversation somewhat abstractly to this point but suddenly looked as if she’d been stung by a bee. She shook her head. I got into the car and took a deep breath. I considered my first step and put my right foot firmly on the brake. Then I put my left foot firmly on the clutch. I put in the key and turned the ignition. The engine purred to life. I looked up at Bill and Mollie ecstatically, like a kid who’s just learned how to pick his nose. But neither of them seemed to notice that I’d just turned the car on without stalling, without neck injury, without spontaneous combustion. “Okay, then.” I said. I was proud of myself. I found the right gear, at least what I hoped was the right gear, and was ready to ease up on the clutch. I moved my right foot off the brake and started pressing on the gas. The engine purred. I took my left foot off the clutch and pushed down on the gas. The car lurched backwards for a moment then slammed to a halt. I’d stalled out. I tried again. This time I floored the gas pedal, finally releasing the clutch so that we shot out of our parking space like the lid off a soda bottle that’s been shaken. I smiled apologetically and shifted the car into first gear. I eased up on the clutch and down on the gas. The car lurched forward a couple of feet and died. “Uggggggghhhhhhhhhhhhhh.”In a span of five minutes I’d moved the car about two feet, most of that back and forth. I turned the key and started again. We’re nearing the end of our time here in Iceland. In less than two weeks we’ll be back home, visiting family, catching up with friends, preparing for another semester. At that time, and even now, there will be a temptation to sum up our time here as entirely positive. It has, after all, consisted of some amazing experiences: beautiful landscapes, chocolate cake, learning Icelandic (okay, just a little), attending conferences, the list goes on and on. But beyond the blog posts, beyond the smiling photos of new friends by waterfalls, beyond the glitz and glamour that usually comes on the surface of these things, our time here has also featured moments of stalling, break-down moments on the side of the road. And I think it’s important in ministry, I think it’s important in life, to acknowledge and be aware of the moments when we do stall. We can’t overlook them, we can’t gloss them over with our felt boards and Sunday school answers. There’s frustration in the stalling, there’s anger, there’s hurt and there’s pain. There’s discouragement, there’s doubt, there’s fear. We can’t pretend that doesn’t exist. Last week we drove up north. Halfway there, Bill asked if I wouldn’t mind driving for a bit so he could get some rest. For upwards of an hour, I did a fine job. I didn’t wreck, I didn’t drive us off a cliff, I didn’t even stall the car. Not once. Then, in the middle of a roundabout, the busiest one we’d seen all day. I stalled. Completely and utterly. And it didn’t matter how hard I tried, how much I focused, I could not get the car moving again. From the outside it must’ve looked like I was trying to make the stupid thing dance to the Jiggy or something. And for a moment, I was ready to curse, cry, and laugh to high heaven all at the same time. In that moment, I needed something outside of myself and I was actually ready to realize it. Life isn’t a smooth road, and even when there aren’t potholes we’re still driving a manual car and it’s not a stall-free journey; we are human, after all. And if we pretend that we’re not stalled on the side of the road, if we pretend there aren’t moments when we’re broken down in the middle of the lane, slamming our fists against the steering wheel, then we’ll always remain there. If we pretend we’re not discouraged, doubting, broken, terrified, and hurt, we won’t admit we need help when the tow-truck arrives and offers to give us a lift. We’ll wipe away our tears and tell him it’s okay; we’re fine. We know how to drive this thing, we’re old pros. And just like that, Jesus passes us by. Grace drives on. I’m not saying He won’t come back, I’m just saying that if we never acknowledge we can’t drive the %#$# car, we’ll just keep waving Him on. Iceland has been wonderful, but it’s not been perfect. I’ve stalled out; I’ve faced discouragement, frustration, fatigue, doubt and questioning, in more ways than just while driving a manual car, in more ways, frankly, than I’m willing to post online. And while I don’t enjoy these experiences, I’m also glad they happened. Because if I leave Iceland and I never remember the taste of chocolate cake, the Icelandic word for “yes” or how to find my way around the Reykjavik bus system, one thing I will have learned from my time here is that I still need grace. I can’t just wave Him on. I’m stalled out on the side of the road and I won’t be going anywhere unless He stops. And I hope He does. Because even in my best of moments, I still need Him. Even if it means finding me in a Blue Beetle named ‘Dorie’, I hope He stops.